You’d be right to argue that most smartphones double as digital cameras these days, but Panasonic’s upcoming Android handsets is in an entirely different league when it comes to snapping photos on the go. Their four-inch Gingerbread device dubbed the Lumix Phone 101P has a high-resolution camera with a 13.2-megapixel CMOS Lumix sensor with Mobile Venus Engine and water-proof body. Lumix is Panasonic’s brand of digital cameras, ranging from pocket point-and-shoot models to digital SLRs. Other specs include a QHD display with a 960-by-540 pixel resolution, a 1GHz OMAP4430 dual-core chip from Texas Instruments, e-wallet features and digital TV tuner. The Lumix Phone 101P should launch on SoftBank’s network in Japan in November. LG this morning announced two new phones engineered around Android 2.3 Gingerbread. 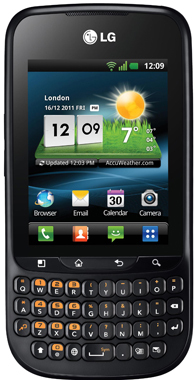 The LG Optimus Pro (LG-C660) and Optimus Net (LG-P690) smartphones – both rolling out in 30 markets this summer beginning in Europe – feature a 1500mAh battery – “the largest in their class”, says LG – and an 800MHz processor. The phones are clearly aimed at the social generation. The Optimus Pro hasa QWERTY keyboard that will appeal to fast typists, a 2.8-inch touch display and dedicated hardware hotkeys for email and scheduler. The device will be available in white, titan and black. The Optimus Net, available in black and white, sports a bigger 3.2-inch 320-by-480 pixel resolution display and LG Social+, the company’s own widget that acts as a hub to popular social networks. It lets you read your friends’ social media feeds, update Facebook and Twitter status, share photos across multiple social media accounts and more. LG wrote another application, SmartShare, that enables the phone to share media with other DLNA-compliant devices. The North American version will include a QWERTY keyboard and in Brazil, China, Asia and the CIS region, the Optimus Net will be dual SIM-compatible. Also, some European carriers will get a version of the device with an NFC chip for mobile payments. More images and full release after the break. Of course, it ain’t the first phone to be called a Facebook phone. But if you’re fan of Zuckerberg’s social network, you should give this one a chance. What’s the number one thing for Facebook (excluding photos)? Yes, status updates. That’s what guided HTC to put a dedicated Facebook share button on the aptly named Status handset, to cater to the Facebook generation that cannot fathom letting an hour go by without firing up a couple of status updates. Apart from the button and the BlackBerry-style physical QWERTY keyboard that sits below the screen, the Status packs in an 800MHz chip, a five-megapixel camera on the back and a VGA camera out the front, a 1,250 mAh battery and a 2.6-inch touchscreen with a 480-by-320 pixel resolution – all driven by Android 2.3 Gingerbread. AT&T wouldn’t say when the phone would be available. Full release and t he complete front shot of the device right below. Considering that Sprint began offering the business-centric XPRT on June 5 of this year, full six months following its November 18, 2010 debut on the Verizon network, here’s to hoping we won’t have to wait that long for this handset.